Yost, Joseph Robert; Harrington, Timothy J.; Pote, Joseph J.; Gross, Shawn P.; Dinehart, David W. (2014). 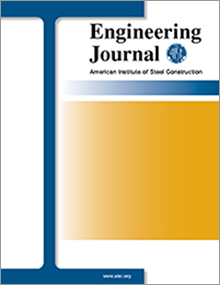 "Experimental Investigation of Steel Joist Design for Ductile Strength Limit State," Engineering Journal, American Institute of Steel Construction, Vol. 51, pp. 1-20. Open web steel joists are prefabricated truss assemblies designed in accordance with specifications set forth by the Steel Joist Institute (SJI). Currently, the SJI design requirement is based on capacity, with no consideration for the governing-member strength limit state. The purpose of this research is to investigate a ductile design methodology for steel joists where the primary strength limit state is characterized by tension-member yielding and large inelastic deformation, followed by a secondary strength limit state of compression member buckling. To achieve ductile behavior, a series of experimental joists were designed and manufactured using controlled over-strength ratios of relative member strengths so that tension-member yielding precluded compression-member buckling. The consequence of adjusting member strengths to induce ductile failure is a slight increase in joist weight. The experimental matrix consisted of 18 joist samples: six identical 33-ft-long K-series joists, six identical 33-ft-long LH-series joists and six identical 32-ft-long rod web joists. All joists were tested to collapse under simply supported uniform load conditions. Experimental results show that a ductile design is achievable because all 18 joists demonstrated tension-member yielding with significant deformation prior to a secondary limit state of compression member buckling.